I had so gotten used to the idea of moving around everyday with the help of gasoline that I had forgotten that there will come a time when the world will eventually run out of sources to get our present kind of gasoline from. Yes, fossil fuel from which we get our gasoline will not last forever and the Arab nations will soon have dry oil wells. This is probably why the search for alternative fuel resources like biofuel has been stepped up one notch. Rumor has it that Zubiri, one of the senators of the Philippines, is a staunch supporter of developing biofuel. This is why during the conflict in the recently concluded senatorial elections, my husband hoped Zubiri would win over Pimentel. I have since shared to my husband though that this seemingly environmentally friendly alternative energy source has a dark side. While I was doing a writing project I discovered that biofuel may yet again be another manifestation of our race’s destructive capabilities. Today, Indonesia and Malaysia combined supply more than 80% of the worldwide demand for biofuel. Because of the great demand for it, a large part of both countries’ forest areas have been cleared to make way for palm plantations that are one of the sources of biofuel. The result is another drastic damage to the delicate balance of nature. 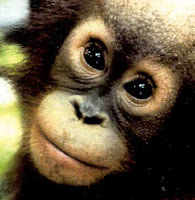 The destruction of forests has displaced the orange haired lovable apes we know as orangutans. Many of these harmless creatures have been brutally killed, injured or left to face the future prospect of starvation. Today, international groups like the Orangutan Conservancy to which the pictures on this post are credited, struggle to save, protect and promote the existence and propagation of orangutans. Unfortunately, there are now only a mere 60,000 of them left in Borneo and Sumatra. It seems we humans have a way of destroying things wherever we poke our fingers into. My husband says Zubiri will be supporting other efforts for creating sustainable sources of biofuel aside from using palm oil. Let’s hope that this time we don’t end up destroying anything else. I took Marine Science this sem. It's a sad subject not because it's easy to fail. It's sad because even our prof, Dr Miguel Fortes, often says the line on your title. Our only consolation, he says, is that by the time the world is in ruins we'd be dead. Ummmmm..........? i certainly agree with this grace...there will always be a cost to pay for all human affairs. what is apparent is what the human needs and not what the world needs. in america for instance, their supply of corn had been cut half for the manufacturing of bio-fuel. this created a wider demand for corn in poultry supply and food industry, hence an agony for all the import products that involved corn.naglisod gani akong amigo palit ug feeds kay mahal na daw kaayo.nagresult man sad na sa starvation sa iyang maga baboy ug eventually ang pagkalugi sa iyang negosyo. i hope that this christmas, people will also think of how to care for the world. hopefully, zubiri too. merry chrsitmas to you, to your hubby, your little princess and the violista varona!!! hi totomel. thanks for dropping by this old post.